(CNN) -- Chinese government authorities have intimidated and unlawfully detained parents and relatives of children who died in last year's Sichuan earthquake and harassed their supporters, an Amnesty International report said this week. 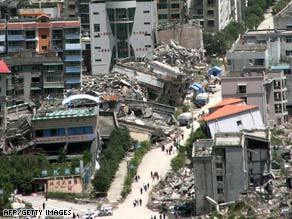 Rubble litters Beichuan, China, nearly a year after an earthquake killed thousands. The 52-page report, released Sunday and titled "Justice Denied: Harassment of Sichuan Earthquake Survivors and Activists," documented instances where parents and relatives said they had been detained for up to 21 days for trying to get answers from officials about their children's deaths. Some said they had been detained several times. "By unlawfully locking up parents of children who died, the government is creating more misery for people who have said in some cases they lost everything in the Sichuan earthquake," said Roseann Rife, deputy program director of Amnesty International Asia-Pacific. "The government of China must cease harassing earthquake survivors who are seeking answers and trying to pick up the pieces of their shattered lives." CNN was not immediately able to get a response to the report from the Chinese government's Ministry of Civil Affairs and Ministry of Justice. The report accused authorities of having prevented parents and relatives from complaining to higher officials about the quality of construction in the buildings that collapsed, referred to by critics as "Tofu Dregs Construction." It further alleged that many parents complained that their phones had been tapped and that they were arbitrarily detained so they would not be able to seek justice in the courts. The human-rights organization called on Chinese authorities "to take immediate action to address the grievances of survivors and relatives of those who were killed or injured" during the 8.0 magnitude earthquake, which struck at 2:28 p.m. May 12, 2008, when many children were in school. As of September, official figures put the death toll at 69,227, with another 17,923 people missing. No official accounting of student deaths has been released, though artist Ai Weiwei has posted the names of 4,827 children who died in the quake, the report said. Parents and survivors have said school buildings were disproportionately affected because they were shoddily constructed, and they have accused government officials and construction contractors of being responsible. The report cited Sichuan Executive Vice-Governor Wei Hong as stating that the earthquake itself was the most important cause of the collapse. But such arguments were not persuasive to some parents. "Except the school building, other buildings in Beichuan county did not collapse during the earthquake," said the father of a 15-year-old who died at Beichuan Middle School. "What kind of earthquake was this?"